It became clear that anything goes in Killer Instinct’s unhinged universe when Rash from Battletoads was announced to join the roster with Season 3, and then, Halo’s Arbiter was announced. Developer Iron Galaxy is definitely doubling-down on the apparent mandate to go nuts, getting clever with an approach to the iconic Halo Elite’s design that incorporates his native mechanics in thrilling ways. 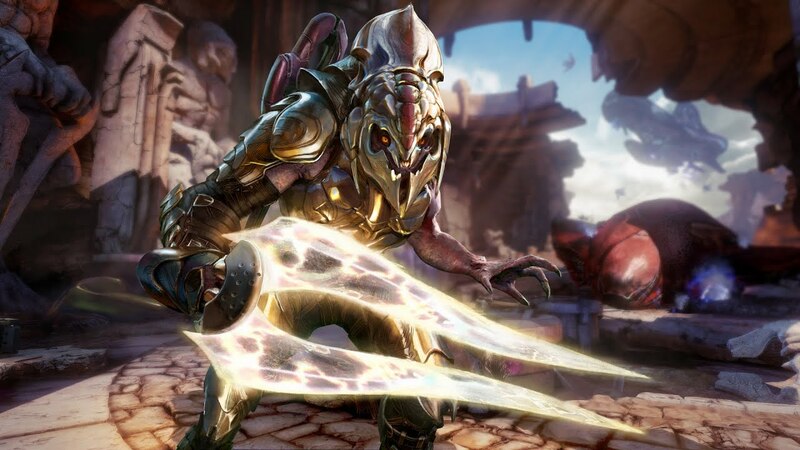 We got to put Arbiter through his paces at the Xbox Spring Showcase, along with the other fighters debuting in Season 3 – notably Tusk, the long-awaited fan favorite. Adam “Keits” Heart, Lead Combat Designer at Iron Galaxy Studio, was on-hand to showcase what these new fighters can do. The most interesting thing about Arbiter’s kit is how it recalls his home universe. His Covenant Carbine is built into his move set, giving him a fast, reliable, long-range poke, though one that’s limited by ammo – once the reserves are gone, they’re gone for good. He’s also got grenades, and though their usage is also limited, they recharge over time. More significant, however, is the fact that they’re agnostic when it comes to splash damage… so if you’re careless about lobbing them, you’ll take a hit, too. To help mitigate this inevitability, Arbiter has access to an overshield that allows him to soak his own grenade damage, as well as any other projectiles that come his way. True to his tactical approach as an Elite, he also has a command throw that he executes from stealth as a Shadow move, to which he can tack on grenades or carbine shots. Arbiter’s high-concept move set is certainly a tough act to follow, but fellow newcomer Tusk seems more than able to hold his own. “He’s an immortal barbarian – a very, very old, very wise man,” said Heart. He sure doesn’t act his age; he doesn’t seem to have much trouble hoisting his six-foot claymore, which gives remarkable, screen-clearing reach to his basic toolset. Based on our brief exposure to Tusk, he seems built to zone opponents with his inherent range in tandem with his slide attacks. He can also punish reckless advances with a deadly uppercut, and perform vicious, skewering follow-ups once they’re on the ground. Rash and Kim Wu, Season 3’s previously-announced additions, were also playable at the Spring Showcase. Like Arbiter, Battletoads’ Rash feels like he was pulled straight out of his game of origin. The mechanics that drive him work as you’d expect in a contemporary fighting game, but they’ve been clearly designed to evoke his origins. If you press his light punch repeatedly, for instance, he’ll execute the sort of “canned combo” that would feel right at home in a beat ‘em up from 20 years ago. Ditto with his grabs – you can pick up an enemy and take them for a walk across the stage before actually doing any damage. And, as if conceived to trigger the most traumatic memories in those who played Battletoads in the olden days, Rash’s Instinct attack summons the bikes from the infamous Turbo Tunnel stage, which you can ride or simply allow to plow into your opponents. Killer Instinct: Season 3 is out March 29 for Xbox One and Windows 10, with cross-play functionality between both platforms. Heart also suggested that there’s more still to be revealed for this expansion, so it’s anyone’s guess how much crazier the roster will get once it’s out.